Pie crust and I are not friends. Never have been. Early attempts at making crust ended in tears and I decided that it was simply easier to buy the ready-made crusts from the freezer section of my local supermarket; a solution which I relied on happily for years. However, my simple solution fell apart after I moved to Germany, a country which does not even have a word for pie in its language. So here I am, trying to learn how to make pie dough and trying not to hold this fact against my husband (who is the reason I am here in the first place). So far neither of these goals seem to be going very well. The first time I tried to make Dorie’s Spinach & Bacon Quiche it was not a pretty sight. 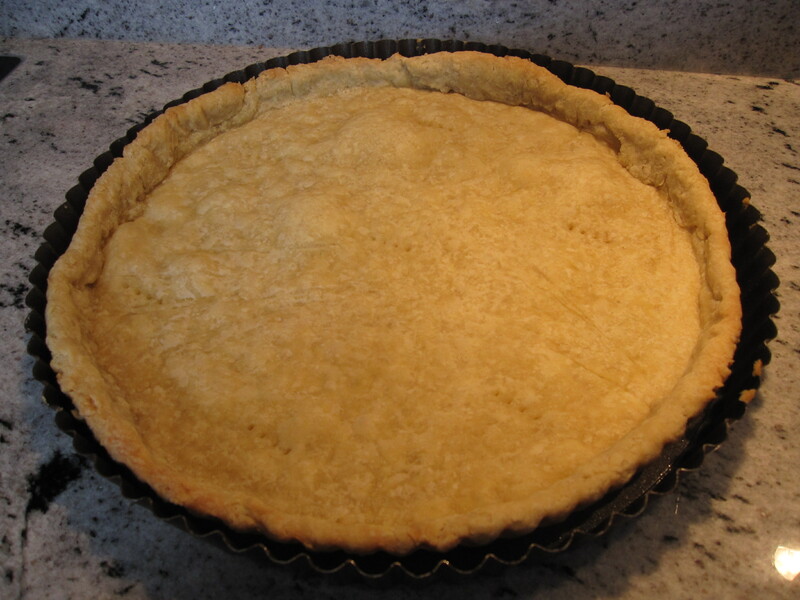 Dorie’s recipe calls for pre-baking the crust before filling it and baking it again with the custard filling. However, my pre-baked crust came out with a small crack in the bottom which I didn’t repair before filling it with the custard. You probably already know how that went, of course my custard leaked out, and since I was using a tart pan with a removable bottom… well, you get the idea. I used my full repertoire of curses (in two languages) while cleaning up after that disaster. But since we’re not moving back to the States any day soon I still need to learn how to make crust and so I decided that I needed to try the quiche one last time, if only to show that I’m not afraid. I think some recipes can smell fear and pie crust is definitely one of them. My primary complaint about pie crust is that it takes FOREVER! Seriously, first you make the dough and then you chill it… then you let the dough sit for just long enough that it is pliable but not so long that it warms up too much and then you roll it out, and then you chill it again… and then you bake it and then you have to let it cool off… all before I’ve even started the primary recipe! And yet when I was a kid my mother made pie crust which went from bare ingredients to finished pie in a matter of hours, so why the heck do I have to wait days? Any suggestions from the experts would be greatly appreciated here. Enough ranting, I am happy to say that my second attempt at Dorie’s Spinach and Bacon Quiche was a success. I said a little prayer as the filled quiche went into the oven and I am happy to say that my crust managed to hold everything together. 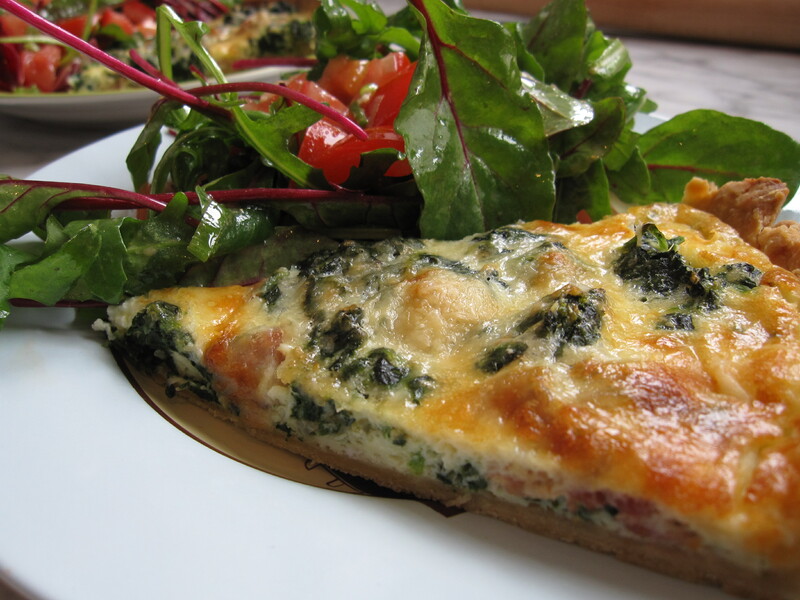 The quiche itself was very tasty and we enjoyed it paired with a simple side salad. But, for now at least, quiche falls squarely into the more-trouble-than-it’s-worth category because of how much time it takes to get the darn crust together. I may have won today’s battle, but the war rages on. This entry was posted in french fridays with dorie, life in germany and tagged Around my French Table, main course. Bookmark the permalink. Congrats on actually getting through the roll-out process! I agree, it seems more trouble than it’s worth. I’ll be sticking with the “press it in the pan with your fingers” method.